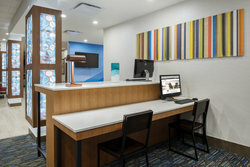 At the Holiday Inn Express & Suites West Plains Southwest, we have comprehensive amenities aimed at creating a space where you will enjoy blissful relaxation. Whether you’re just stopping by while passing through West Plains or are staying with us on an extended business trip, our spacious suites and excellent amenities are sure to be the ideal lodgings for you! Our friendly hotel staff is always on hand to take care of anything you might need and to provide insightful advice on local attractions, nearby dining, and to assist with planning and transportation. With such a dynamic property and all of our wonderful amenities, it is no surprise that we are the highest rated hotel in the area, book a room today to see for yourself! 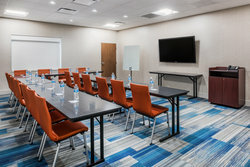 Take a dip in our indoor pool, enjoy some fresh air by lounging on our outdoor patio, rent a meeting space for an event, grab last minute supplies or snacks in our Sundry Shop, or connect to home or the office from the comfort and convenience of our on-site business center. 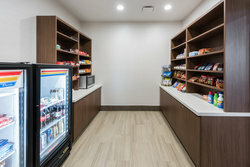 Find out more about our amenities below and book your stay at Holiday Inn Express & Suites West Plains Southwest, the #1 hotel in West Plains, today! 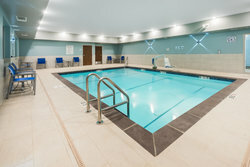 Take a dip in our heated indoor pool! Relax in the pool or swim some laps. Open daily. The pool also has accessibility features. Make use of multiple computers as well as electrical outfits. Our fast WiFi is available throughout the hotel for guests. We also offer printing services. Pick up anything you may have forgotten, from detergent for the self-laundry, to a late night snack or early morning pick-me-up! 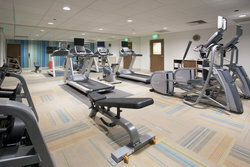 Our 24 hour fitness center has treadmills, ellipticals, and free weights, for a full body work out! We have two meeting rooms that offer flexible space for gatherings and business meetings. Our board room has space for up to 10 people, and our more flexible meeting room has space for up to 30 people. We have a variety of professional facilities, including A/V equipment, and everything you need to lead a meeting. 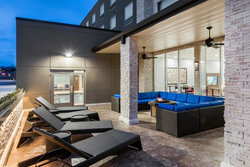 Enjoy some fresh air on our patio, with flexible gathering space and loungers for sunny days!